Discount Carpet has many in-stock carpet styles for immediate installation. Discount Carpet also carries the coveted Dupont Smartstrand™, the ideal carpet for pets, children and high traffic areas. Discount Carpet has a large collection of colors, patterns, designs and shades to match with different decors whether it be for residential or commercial use. In addition, we carry hundreds of varieties from major manufacturers with a wide variety to choose from including berbers, plushes, textures, friezes and patterns. We take pride to bring you the best brands of carpets at great low, low prices. Vinyl is a great choice for luxury at affordable prices. The beauty of vinyl is its adaptability, strength and ease of maintenance. Vinyl floors can be created to give the look of wood, ceramic tile or even marble. Discount Carpet has first quality, vibrant vinyl designs waiting for you! So, if you are interested in creating a great looking floor at a great price, send us an email or visit us today. Hardwood flooring is a luxurious, easy to maintain, durable and it adds value to your home. Discount Carpet has a wide variety of hardwood styles and colors. Choose from solid, engineered, plank or strip in oak, walnut, Brazilian cherry, maple, bamboo and more. Come see us today to add this elegant and durable look to your home or office. Laminate creates the elegance of a wood or stone floor and are very affordable. Because they are easy to maintain, laminate flooring is perfect for homes with children and pets. 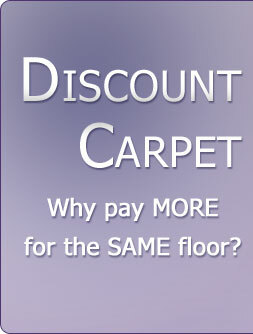 Discount Carpet has many options to choose from; smooth or textured finishes, hand-scraped or tile looks. If you want the grace of wood or stone at a low cost, visit or email us at Discount Carpet today! Tile flooring creates a rich, customized look to any home or office. You can choose from ceramic, porcelain and vinyl tiles in various sizes and colors to create your own look. Discount Carpet carries a wide variety of ceramic choices form Mannington, Mohawk and Shaw. You may also want to consider Congoleum’s Duraceramic™ or Mannington Adura™ which is warmer and more comfortable than ordinary ceramic. The limestone composite construction resists cracking and it is extremely durable and easy to maintain. Contact us by email or visit our friendly sales staff to view all of our beautiful tile options. While at Discount Carpet, be sure to take a look at the carpet and vinyl remnant room specializing in large size remnants, some over 16 feet in length. All are first quality and ready to go. Visit our show room today because when these deals are gone, they’re gone!